Happy Thanksgiving Holiday. After hopefully stuffing your bellies with delicious food yesterday, take a moment to quench your curiosity with this addition of FSF! Claes and Bellemans described the structure and hypothesized about the function of this ligament in the Journal of Anatomy, but they were not the first to theorize about the existence of an extra ligament in the knee. In 1879 a french surgeon postulated about the existence of an additional ligament in the human knee, though the structure evaded classification for many years. 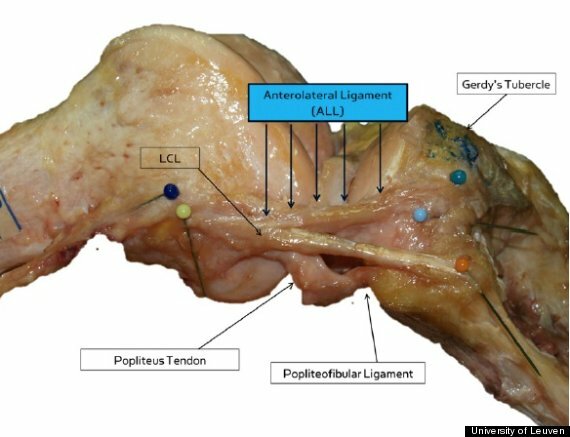 An image of a right knee following a complete dissection illustrates the anterolateral ligament. Whatever the function of the ALL, this finding reminds us that despite our advanced technology, the basic anatomy of the human body is not yet complete! Happy Fun Science Friday yall! Happy Fun Science Friday - Ice Cream! ?